“Jingle bells, jingle bells, jingle all the way!” Oh what fun it is to have a Christmas themed baby shower! Whether the baby is due around Christmas time or in the weeks thereafter, this is a fun and easy theme! 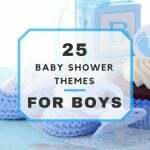 Deck the halls and prepare to have a great time at this baby shower! We all know that Santa makes his list and checks it twice, and this should apply to a baby shower guest list, too! Once you have your guest list set to go, how about looking for invitations online? It’s better to purchase invitations online because you have a larger variety which means you are more likely to find what you are looking for. Also, the invites online tend to be customizable, which means it will save you time and hand cramps! Websites like Etsy and Zazzle are the very best places to look. Take this invitation design from silverscraps on Etsy; it’s totally customizable, beautiful, and classy. For just $15.00, you get a high-quality digital file which you can use to make prints at home or anywhere that prints pictures! Not bad! Christmas lights: With so many kinds to choose from, you’re bound to find some that really light up the room! Hang some nice Christmas lights around the perimeter of the room to add to the Christmas ambiance. Centerpieces: Tables need centerpieces and I have a cheap, easy, and cute DIY idea for you! Using a glass cylinder vase (Dollar Tree sometimes has these), hang candy canes all around the outside, packing them in as tightly as possible. Next, get glitter white tissue paper, some red, and some green tissue paper as well, and put those inside the vase in the same manner you would a gift bag. Poinsettias: If there’s any kind of plants or flowers in the decor, it should be Poinsettias! These are a beautiful flower commonly associated with Christmas and make a very gorgeous addition to any room, let alone a baby shower! Santa hat brownie bites: Make a batch of brownies and cut them into small squares. Using marshmallow fluff or white frosting, place a glob on each brownie, followed by a strawberry with the top cut off, point face up. Last, you will do another small glob of the marshmallow fluff or frosting on the tip of the strawberry and you’ve made little Santa hats on the brownies! Red velvet cake: Every baby shower needs a cake, and red velvet is about as tasty and festive as they come! Have a belly cake made and decorated up to be Christmas chic! Chocolate-dipped strawberry Christmas tree: Pick up a big foam cone from any craft store and make some chocolate-dipped strawberries. Using frilled club toothpicks, begin pinning strawberries to the cone, starting from the bottom, working your way around, then up until the whole tree is covered. Top it off with a big star or a large strawberry! BLTs: Three ingredients (with condiments on the side): Bacon, lettuce, and tomato. It already has the Christmas colors right on the sandwich, and they are so easy to make! Besides, who doesn’t love a bacon sandwich? Eggnog: This is just a must-have Christmas drink! Don’t forget the nutmeg! “He never let poor Rudolph join in any reindeer games!” Well at a Christmas baby shower, everyone gets to join in on the games! 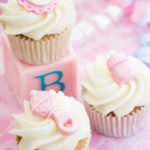 In need of a few Christmas baby shower ideas? Here’s some you don’t want to miss! Sketchy Santa baby: Everyone holds a paper plate on their head and uses a pencil to draw a baby on the plate wearing a santa hat! Whoever has the best blind sketch is the winner! What’s in the stocking? : This is a game where you place one baby item in each stocking. Ten is a good number to have. Place something else in each stocking to make it more difficult, like packing peanuts. Be sure to tie off the tops. Whoever guesses the most correctly is the winner! 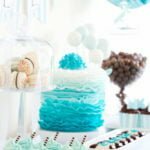 Jolly belly: At a baby shower, it’s not only the mama-to-be who has a big belly! In teams of two or three, using a beach ball and toilet paper, one team member must wrap another team member with toilet paper to hold the beach ball up at the belly. Once secure, the person who was wrapped must rush across the room to grab the santa hat and put it on. first person to get the hat on is the winner! It’s no secret that Christmas time is a time to be thankful for everyone near and dear in your life, and many of these people will be at the baby shower! For a Christmas baby shower, think mason jars dressed up with a Santa hat and belt! Fill it with yummy Christmas candies or the dry ingredients for Christmas cookies including a label for baking instructions. To all a good night!